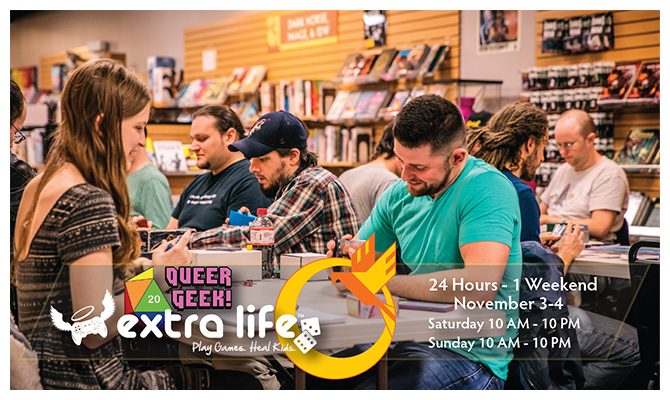 On November 3rd, we'll be hosting 24 hours of board and video gaming alongside our friends from Queer Geek to raise money for charity! Here's how you can help. What's Happening: For 12 hours a day across the weekend, our team will be here in the store playing video games and board games. You can stop by and wish folks well, donate in person or join in a game! You may even be able to watch us game through twitch (we're still ironing out the details there though, more info on that as we come by it). Who Benefits: Proceeds raised benefit the Children's Miracle Network Hospitals. Last year Team Queer Geek beat their goal by nearly $1500. This year we aim to beat that number, and we could use your help to do that! How you can Help: Team Queer Geek will be accepting donations directly during the event, but you can also donate online through the link below.